Singer and Composer William George has performed with musical organizations around the world, including the Metropolitan, Los Angeles, San Francisco, and New York City Operas, and festivals and concerts in Sweden, Finland, England, Germany, China and the Philippines. An active recitalist and new-music performer, Will is co-founder and Artistic Director for Vancouver’s Erato Ensemble. His recordings include “Dew-drops on a Lotus Leaf” by Marga Richter, “Viola Jokes” with acclaimed violist Melia Watras, and “Geometrics” by L. Warde. As a composer, William’s compositions have been performed in Canada, the United States and Europe. He is the recipient of several ASCAPlus Awards, and is an Associate Composer of the Canadian Music Centre. Will also serves as lead singer-songwriter for the roots-rock band Horse Opera. 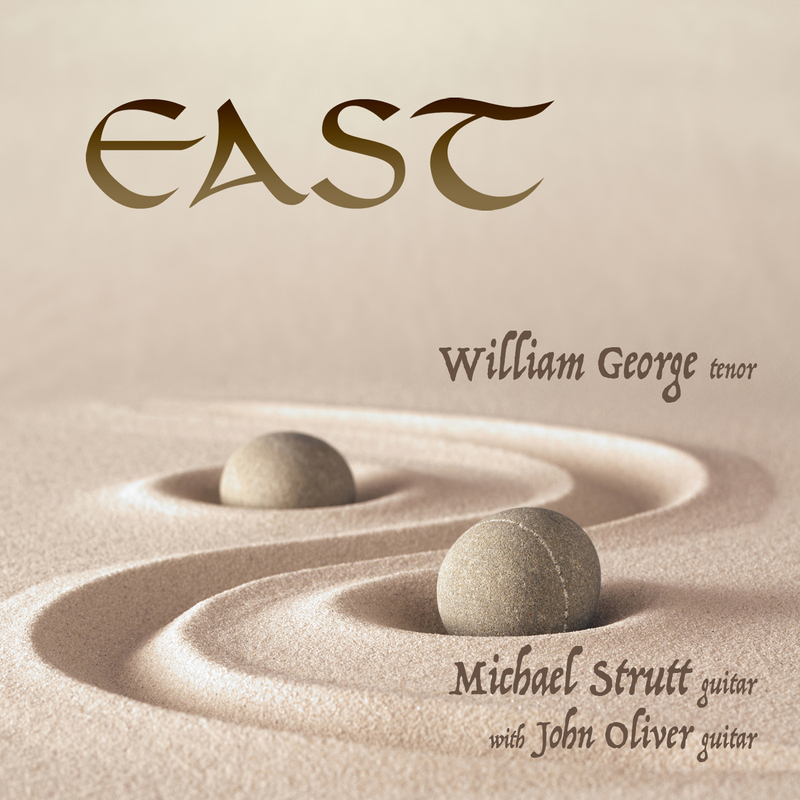 Michael Strutt has performed in all major Canadian cities and in England, Spain, the United States and Poland. He studied the guitar with Julian Bream in England and Jose Tomas in Spain. In 1968 he was first prizewinner in the Granada Television competition New Faces. After moving to Canada in 1969, Michael became a faculty member of McGill and Concordia Universities in Montreal, and the University of Ottawa. He later taught for 27 years at the University of British Columbia, and was Head of the String Division at Douglas College. Michael’s recordings range from numerous CBC broadcasts, his album “Komachi,” seven CD’s including “Stroll in the Cool” which was nominated for a 2007 Western Canadian Music Award. He has a special interest in the contemporary repertoire and has premiered more than 25 Canadian Guitar works, many written specially for him. After 50 years of professional musical life, Michael retired in 2015. He now lives in Perth in Western Australia. The first song, The Tarrying Garden, introduces us to some of the main features of a classical Chinese garden: the covered walks, courtyards, rocks and pools, the poetic inscriptions on whitewashed walls and the characteristic zig-zag paths offering no long vistas, but constantly changing views and impressions. We are also instructed in how to enjoy our visit to the garden: “Meander, tarry, amble, pause, admire.” The second song is a nocturne evoking the atmosphere of the exquisite Master-of-Nets Garden on a moonlit night. The third song records the somewhat whimsical observations of a visitor to the Garden of the Gentle Waves Pavilion. The final song remembers Mr Wang, the self-styled Humble Administrator, who (somewhat mysteriously, considering his official income) managed to create one of Suzhou’s most famous treasures. *Note: William George and Michael Strutt presented the Canadian premiere of this cycle at the Dr. Sun Yat Sen Classical Garden in Vancouver. Three Moon Songs of Li-Po is a three-movement song cycle for voice and guitar. All three poems concern a mutual observance between man and moon. In the first song, the moon is greeted as a friend to keep the poet company. In the second, the moon bears witness to the futility of war. In the final song, the moon represents home to the wandering poet. All translations are my own. It would seem that the Japanese poet, Matsuo Basho (1644-94) spent most of his latter years in a series of wandering journeys (what we would consider ‘walking holidays’) collecting ideas for his poems. These are known in Japan as ‘Haiku’ which follow a strict seventeen syllable structure. A form which makes translation almost impossible without over-running the structure. These little poems are rather like an artist’s quick sketch of a place or incident but captured in a few words. As I watched my father, who was Lebanese, deteriorate on his deathbed, I completely identified with the words and emotions in Dylan Thomas’ poem. Musically, I embraced the tightly-structured villanelle poetic form, and translating this to a popular song structure was an obvious choice. The repeating line throughout the poem, “Do not go gentle into that good night” is clearly the connecting thread in the poem. It was immediately evident that this should become the chorus. However, unlike a poplar song, the setting of each stanza changes in order to better express the emotion of the text. The middle eastern musical influence is in honor of my father’s heritage. Omar Khayyām, whose poetry I have chosen for these songs, was a medieval Persian polymath. He is best known in the West for his quatrains, which were made known particularly due to the efforts of Edward Fitzgerald. Although concise and simple, each quatrain is rich in thought and addresses important philosophical concerns, which may have later inspired the writings of Sufi thinkers such as Rumi and Attar. In this style, the tavern can be a place of worship, where one can lose oneself to connect with the unseen beloved (the divine). Fitzgerald’s translations went through numerous poetic revisions. In the case of False Morning, for example, the revisions gradually departed from Khayyām’s original quatrain. The final result can no longer be considered a direct translation of Khayyām, but rather an adaptation, or a reinterpretation of the essence of Khayyām’s philosophy. The English poems serve more as a conveyance transporting readers to the world of Khayyām, rather than exact translations. The issue of authenticity aside, Fitzgerald’s poetic adaptations are appealing in their musical flow and structure, qualities they share with classical Persian poetry. The music maintains the apparent simplicity of Khayyām’s message and Fitzgerald’s words, while drawing parallels between some of the underlying poetic connections. I composed these eight miniatures expressly for Judith Forst and the CBC Radio Orchestra in 1995. June Goldsmith, Artistic director of Music in the Morning, co-commissioned Unseen Rain with the CBC Radio Orchestra. In the early stages, as we discussed ideas, June suggested I read any writings by the Sufi poet Jalal al-Din al-Rumi. Rumi was a prolific writer, whose meeting, at age 37, with a great mystic, Shams, elicited a pouring forth of improvised quatrains about love and true friendship. The quatrains come off the page in English translation as imagist poems, like little diary entries. This was a great discovery for me and timely, too. My new interest in concise forms found its match in the quatrains. Over the years I have been interested in exploring the art song form in a context that includes the music of the World. So whereas one might hear a spiritual debt owed to Schubert, the musical language takes in Bartok, Berg and Persian folk song as well. John Moyne and Coleman Barks, the translators of the Rumi quatrains I used, remarked that in the original Sufi, they are “sonically very dense, with clusters of similar or identical sounds piled quickly one upon the other.” The translators were not able to retain this characteristic, partly because of their intention “to connect these poems with a strong American line of freeverse spiritual poetry.” In this spirit, I have created an accompaniment that sees a piling-up of sounds, but one that also creates a sense of sudden mystery and clarity. The version heard here is a recent transcription for voice and guitar.